Between 1987 and 2004, IT’s share of annual investment in fixed assets almost doubled globally, and despite recent economic challenges, IT spending continues to grow to a total of about $3.3 trillion this year. About 30% of that investment is made by the financial and manufacturing sectors. My experience has been in taking advantage of the opportunities provided by IT to attain higher levels of innovation and transformation. IT is changing the way business is done and the way we live, but progress is not easy in any industry. The Standish Group studies the performance of the IT industry in terms of project implementation. In 1994, it found that about 16% of IT projects were successful in that they were able to deliver on time, within budget and the expected quality (Figure 1). Fifteen years later, our ability to implement projects successfully is about 30%. 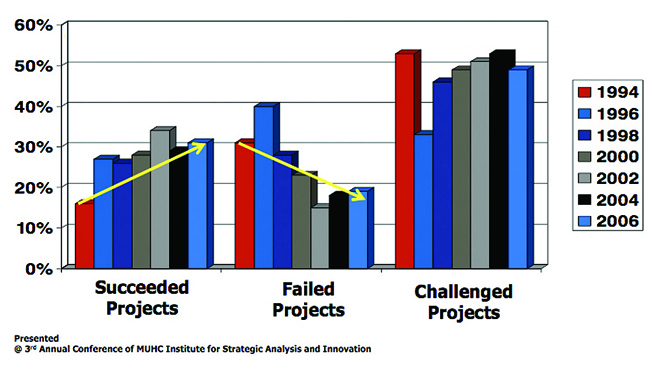 The proportion of failed projects — meaning cancelled with no light at the end of the tunnel — is about 20%. The return on investment in IT projects is also highly variable despite a clear and positive relationship between IT investment and productivity growth. In a 2000 study by the Conference Board, 40% of IT projects failed to achieve their business objectives within one year: they could not deliver the return on investment promised in their business case. In 2008, a study on the implementation of more complex systems that impact more business processes and multiple stakeholders found that there was only a 7% chance of those projects coming in on time and nearly two-thirds exceeded their implementation budget. Even once the software was up and running, more than half suffered operational stoppages. Just 20% of the companies realized 50% or more of their projected benefits. This study included financial and manufacturing industries. Variance is also very high in user uptake of IT solutions. Research by Professor McCaffee from Harvard University found a high variance in IT adoption rates — between 30% and 75%. A 2008 study found that companies had only a 50% chance that users would use a new application. Why are companies still investing? When 30% to 75% of projects fail, that means that 25% to 70% succeed. The problem is the companies that are succeeding are making successful transitions and are creating progress. Users and customers get used to it, discover new needs and expect more. This competitive pressure is pushing companies to continuously innovate and create value by doing things better, faster, cheaper and smarter. In the late 1990s, the Internet was just starting to show up in business, and companies were trying to figure out what it meant to them and how they should use it. I was fortunate to be part of a team created by John Reid at Citibank, who had a vision that the Internet would be the new delivery infrastructure for financial services all over the world. 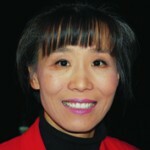 He created a team to develop Internet-based financial products and services. Despite a high level of resistance and concerns about privacy and other business and technology challenges, the team I was involved with was able to deliver the first Internet banking in the world, launched in seven countries simultaneously. Today, Internet banking is part of everyday life. There is a simple reason for initiating change: those who do so will have an opportunity to gain experience in managing the change that inevitably occurs. Can IT failures be avoided? Over time, CIOs and business executives become savvier at understanding what makes some projects succeed and others fail. The sidebar opposite shows the common culprits in failed projects. These include incomplete requirements, lack of user involvement, lack of resources, unrealistic expectations and a lack of executive support. Project success factors include user involvement, executive management support, a clear statement of requirements, proper planning and realistic expectations. IT provides an opportunity for an organization to operate as an entity to improve performance. My twenty years of experience as an IT practitioner have taught me that technology is, in and of itself, fairly uninteresting unless it is wrapped in a solution that addresses all those non-technological issues. Using the 80/20 rule as a generalization, 80% of the challenges related to technology enablement are anchored around organizational, people and process dynamics. Only 20% of the challenges are related to the technology itself. 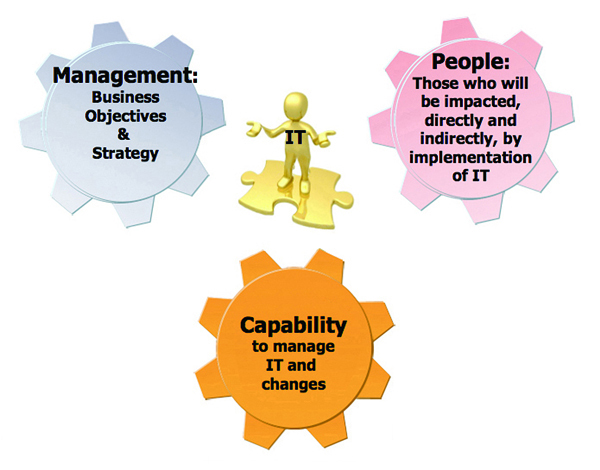 Improving the success rate requires a choreography among three key elements (Figure 2): management, which needs to determine the business objective and strategy of the IT system; people who are going to be impacted directly or indirectly by the systems and need to be involved from the start; and the capability to not only manage IT, but also ensure that changes are made to the system as needed. Involving people requires overcoming a universal distaste for change and touching people’s emotions in order to touch their hearts and change their behaviour. It goes far beyond informing people through memos: they need to commit and actively participate from the beginning as valued contributors to shaping the future. As users work with new systems they will discover new needs. The ability to manage evolution and change — as opposed to aiming for perfection the first time — requires different management skills and the ability to thrive in chaos. 1. Expect resistance and reluctance and prepare as early as possible. 2. Expect a dip in performance after the system goes live and plan ahead. 3. Do not expect to see performance improve immediately. Provide the support needed to accelerate the learning curve and minimize the dip in performance.